Both Trump and Clinton have pledged to pour more money into the already bloated military and security apparatus. To say that this is the election from hell is to insult hell. There’s been nothing like this since Washington forded the Rubicon or Trump crossed the Delaware or delivered the Gettysburg Address (you know, the one that began, “Four score and eleven women ago…”)—or pick your own seminal moment in American history. Billions of words, that face, those gestures, the endless insults, the abused women and the emails, the 24/7 spectacle of it all… Whatever happens on Election Day, let’s accept one reality: We’re in a new political era in this country. We just haven’t quite taken it in. Not really. Doh! Why did I write that? Who could possibly forget the first presidential candidate in our history preemptively unwilling to accept election results? (Even the South in 1860 accepted the election of Abraham Lincoln before trying to wave goodbye to the Union.) Who could forget the man who claimed that abortions could take place on the day of or the day before actual birth? Who could forget the man who claimed in front of an audience of nearly 72 million Americans that he had never met the women who accused him of sexual aggression and abuse, including the People magazine reporter who interviewed him? Who could forget the candidate who proudly cited his positive polling results at rallies and in tweets, month after month, before (when those same polls turned against him) discovering that they were all “rigged”? Whatever you think of The Donald, who in the world—and I mean the whole wide world (including the Iranians)—could possibly forget him or the election he’s stalked so ominously? When you think of him, however, don’t make him the cause of American political dysfunction. He’s just the bizarre, disturbed, and disturbing symptom of the transformation of the American political system. Admittedly, he is a one-of-a-kind “politician,” even among his associates in surging right-wing nationalist and anti-whatever movements globally. He makes France’s Marine Le Pen seem like the soul of rationality and Philippine President Rodrigo Duterte look like a master tactician of our age. But what truly makes Donald Trump and this election season fascinating and confounding is that we’re not just talking about the presidency of a country, but of the country. The United States remains the great imperial state on Planet Earth in terms of the reach of its military and the power of its economy and culture to influence the workings of everything just about everywhere. And yet, based on the last strange year of election campaigning, it’s hard not to think that something—and not just The Donald—is unnervingly amiss on Planet America. Sometimes, in my fantasies (as while watching the final presidential debate), I perform a private miracle and bring my parents back from the dead to observe our American world. With them in the room, I try to imagine the disbelief many from that World War II generation would surely express about our present moment. Of course, they lived through a devastating depression, light years beyond anything we experienced in the Great Recession of 2007–08, as well as a global conflagration of a sort that had never been experienced and—short of nuclear war—is not likely to be again. Despite this, I have no doubt that they would be boggled by our world and the particular version of chaos we now live with. To start at a global level, both my mother (who died in 1977) and my father (who died in 1983) spent decades in the nuclear age, the era of humanity’s greatest—for want of a better word—achievement. After all, for the first time in history, we humans took the apocalypse out of the hands of God (or the gods), where it had resided for thousands of years, and placed it directly in our own. What they didn’t live to experience, however, was history’s second potential deal-breaker, climate change, already bringing upheaval to the planet, and threatening a slow-motion apocalypse of an unprecedented sort. While nuclear weapons have not been used since August 9, 1945, even if they have spread to the arsenals of numerous countries, climate change should be seen as a snail-paced version of nuclear war—and keep in mind that humanity is still pumping near-record levels of greenhouse gases into the atmosphere. I imagine my parents’ amazement that the most dangerous and confounding issue on the planet didn’t get a single question, not to speak of an answer, in the three presidential debates of 2016, the four and a half hours of charges, insults, and interruptions just past. Neither a moderator, nor evidently an undecided voter (in the town hall second debate), nor either presidential candidate—each ready to change the subject on a moment’s notice from embarrassing questions about sexual aggression, emails, or anything else—thought it worth the slightest attention. It was, in short, a problem too large to discuss, one whose existence Donald Trump (like just about every other Republican) denies, or rather, in his case, labels a “hoax” that he uniquely blames on a Chinese plot to sink America. I would have to take a deep breath and explain to my parents that, in twenty-first-century America, by Supreme Court decree, money has become the equivalent of speech, even if it’s anything but “free.” And let’s not forget that other financial lodestone for an American election these days: the television news, not to speak of the rest of the media. How could I begin to lay out for my parents, for whom presidential elections were limited fall events, the bizarre nature of an election season that starts with media speculation about the next-in-line just as the previous season is ending, and continues more or less nonstop thereafter? Or the spectacle of talking heads discussing just about nothing but that election 24/7 on cable television for something like a full year, or the billions of ad dollars that have fueled this never-ending Super Bowl of campaigns, filling the coffers of the owners of cable and network news? We’ve grown strangely used to it all, but my mom and dad would undoubtedly think they were in another country—and that would be before they were even introduced to the American system as it now exists, the one for which Donald Trump is such a bizarre front man. What Planet Is This Anyway? I wish I still had my high school civics text. If you’re of a certain age, you’ll remember it: the one in which a man from Mars lands on Main Street, USA, to be lectured on the glories of American democracy and our carefully constructed, checked-and-balanced tripartite form of governance. I’m sure knowledge of that system changed life on Mars for the better, even if it was already something of a fantasy here on Earth in my parents’ time. After all, Republican President Dwight D. Eisenhower—my mom and dad voted for Democrat Adlai Stevenson—was the one who, in his farewell address in 1961, first brought “the potential for the disastrous rise of misplaced power” and “the military-industrial complex” to the attention of the American people. Yes, all of that was already changing then, as a peacetime war state of unparalleled size developed in this country. Still, 30-odd years after my father’s death, surveying the American landscape, my parents might believe themselves on Mars. They would undoubtedly wonder what exactly had happened to the country they knew. After all, thanks to the Republican Party’s scorched-earth tactics in these last years in bipolar Washington, Congress, that collection of putative representatives of the people (now a crew of well-paid, well-financed representatives of the country’s special interests in a capital overrun with corporate lobbyists), hardly functions anymore. Little of significance makes it through the porticos of the Capitol. Recently, for instance, John McCain (usually considered a relatively “moderate” Republican senator) suggested—before walking his comments part way back—that if Hillary Clinton were elected president, his fellow Republican senators might decide a priori not to confirm a single Supreme Court justice she nominated during her tenure in office. That, of course, would mean a court now down to what looks like a permanent crew of eight would shrink accordingly. And his comments, which once would have shocked Americans to the core, caused hardly a ripple of upset or protest. On my tour of this new world, I might start by pointing out to my mom and dad that the United States is now in a state of permanent war, its military at the moment involved in conflicts in at least six countries in the Greater Middle East and Africa. These are all purely presidential conflicts, as Congress no longer has a real role in American war-making (other than ponying up the money for it and beating the drums to support it). The executive branch stands alone when it comes to the war powers once checked and balanced in the Constitution. And I wouldn’t want my parents to simply look abroad. The militarization of this country has proceeded apace and in ways that, I have not the slightest doubt, would shock them to their core. I could take my parents, for instance, to Grand Central Station in midtown Manhattan, their hometown and still mine, and on any day of the week they would see the once-inconceivable: actual armed soldiers on guard in full camo. I could mention that, at my local subway stop, I’ve several times noted a New York police department counterterror squad that could be mistaken for a military Special Ops team, assault rifles slung across their chests, and no one even stops and gawks anymore. 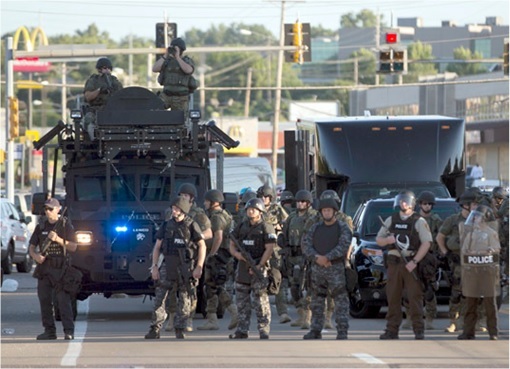 I could point out that the police across the country increasingly have the look of military units and are supplied by the Pentagon with actual weaponry and equipment directly off distant US battlefields, including armored vehicles of various sorts. I could mention that military surveillance drones, those precursors of future robotic warfare (and, for my parents, right out of the childhood sci-fi novels I used to read), are now regularly in American skies; that advanced surveillance equipment developed in far-off war zones is now being used by the police here at home; and that, though political assassination was officially banned in the post-Watergate 1970s, the president now commands a formidable CIA drone force that regularly carries out such assassinations across large swaths of the planet, even against US citizens, and without the say-so of anyone outside the White House, including the courts. I could mention that the president who, in my parents’ time, commanded one modest-sized secret army, the CIA’s paramilitaries, now essentially presides over a full-scale secret military, the Special Operations Command: 70,000 elite troops cocooned inside the larger US military, including elite teams ready to be deployed on what are essentially executive missions across the planet. I could point out that, in the twenty-first century, US intelligence has set up a global surveillance state that would have shamed the totalitarian powers of the previous century and that American citizens, en masse, are included in it; that our emails (a new concept for my parents) have been collected by the millions and our phone records made available to the state; that privacy, in short, has essentially been declared un-American. I would also point out that, on the basis of one tragic day and what otherwise has been the most modest of threats to Americans, a single fear—of Islamic terrorism—has been the pretext for the building of the already existing national security state into an edifice of almost unbelievable proportions that has been given once unimaginable powers, funded in ways that should amaze anyone (not just visitors from the American past), and has become the unofficial fourth branch of the US government without either discussion or a vote. Little that it does—and it does a lot—is open to public scrutiny. For their own “safety,” “the People” are to know nothing of its workings (except what it wants them to know). Meanwhile, secrecy of a claustrophobic sort has spread across significant parts of the government. The government classified 92 million documents in 2011 and things seem not to have gotten much better since. In addition, the national security state has been elaborating a body of “secret law”—including classified rules, regulations, and interpretations of already existing law—kept from the public and, in some cases, even from congressional oversight committees. Americans, in other words, know ever less about what their government does in their name at home and abroad. I might suggest to my parents that they simply imagine the Constitution of the United States being rewritten and amended in secrecy and on the fly in these years without as much as a nod to “We, the People.” In this way, as our elections became elaborate spectacles, democracy was sucked dry and ditched in all but name—and that name is undoubtedly Donald J. Trump. Consider that, then, a brief version of how I might describe our new American world to my amazed parents. None of this is The Donald’s responsibility. In the years in which a new American system was developing, he was firing people on TV. You could, of course, think of him as the poster boy for an America in which spectacle, celebrity, the gilded class of One Percenters, and the national security state have melded into a narcissistic, self-referential brew of remarkable toxicity. Whether Hillary Clinton or Donald Trump is elected president, one thing is obvious: The vast edifice that is the national security state, with its 17 intelligence agencies and enormous imperial military, will continue to elaborate itself and expand its power in our American world. Both candidates have sworn to pour yet more money into that military and the intelligence and Homeland Security apparatus that goes with it. None of this, of course, has much of anything to do with American democracy as it was once imagined. Someday perhaps, like my parents, “I” will be called back from the dead by one of my children to view with awe or horror whatever world exists. 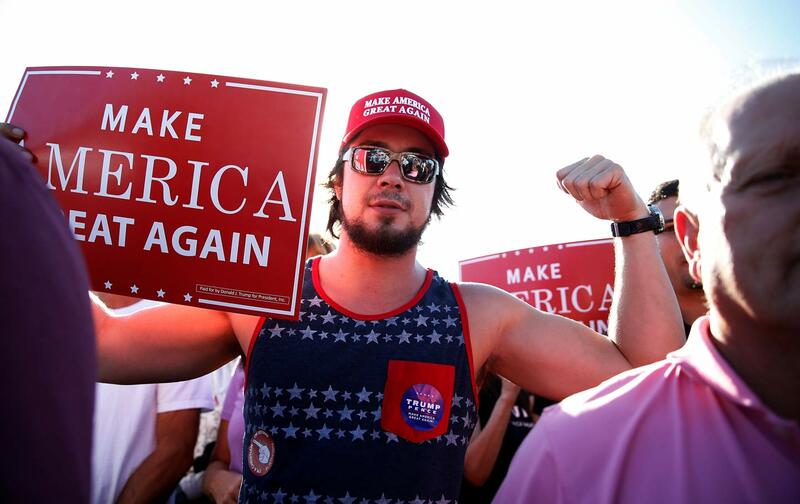 Long after the America of an unimaginable Donald J. Trump presidency or a far-more-imaginable Hillary Clinton version of the same has been folded into some godawful, half-forgotten chapter in our history, I wonder what will surprise or confound “me” then. What version of our country and planet will “I” face in 2045?